And it had all the ingredients of a classic Monopoly Tour visit and yet ended in beers, tears and something else that rhymes with …ears. Years perhaps? I’ll deal with the visit first and then the fallout and aftermath second. So, here we were, steaming down the final side of the board and reaching the final of the green squares, the slightly more expensive Bond Street. 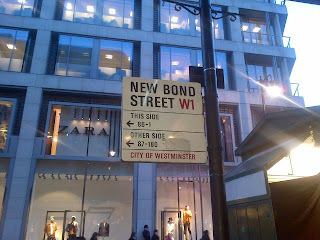 Again for those Monopoly egg-heads and trivia buffs you might know that there isn’t really a single street called “Bond Street” but the place is made up of both “New” and “Old” Bond Streets. The streets themselves join at the elbow so to speak (look at a map and you’ll see what I mean) and there’s just a narrow pathway that joins the two roads together. It was whilst checking this out on Google StreetView that I secured an element that’s been missing from a couple of recent visits, the interesting and historical feature, but more of that later. So we had the venue and as any regular reader of the blog will have cottoned on by now, the organising of the pubs follows pretty much straightforward from that. There was a nice line of Cask Marque accredited places leading down from Bond Street Tube Station, following New Bond Street into Old Bond Street. 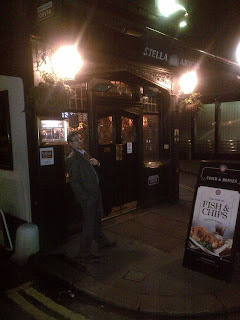 So it terms of pubs, there were no dramas here, just the actual date of the tour to finalise. Without going into too many personal details, it was this week that I had to endure the annual ritual of moving one more year nearer to death (oh how pithy that turned out to be!) so with the agreement of the lovely family, I was allowed to have the tour on my actual birthday, which whilst not the best plan for a mid-week night, with only 5 pubs planned and Aussie Pete’s dad in special attendance what could possibly go wrong. And whilst on the subject of attendees we’ll just confirm the other folk appearing in this episode; from the office the only original office regulars were Buddy Rob and New Guy Micky although they were joined by the two most dedicated of the female office drinkers, Gemma and Nicole. Both Aussie Pete (including Aussie Dad) and Spiky Haired Ed were on holiday but had agreed to meet us in the first pub so the only new face to introduce was that of James James Morrison Morrison. James had been slightly hoodwinked into this week’s visit after promising to come on the next “local” trip (which would be Liverpool Street Station) but somehow the scheduling hadn’t quite worked out that way and he ended up a rather reluctant extra on this birthday tour. Not compulsory to "adopt the position" inside. The first pub was Taylor Walker’s Spread Eagle (which caused some odd requests for the obligatory photo) which is on Woodstock Street, a road leading off Oxford Street. Aussie Pete and Aussie Dad were already in position but the rest of us arrived almost in tandem with Spikey Haired Ed, although the latter was already moaning that he had another engagement and would have to leave early. Anyway just in time to get the round in, in fact, which consisted of some left over “Luck of the Irish” from Stonehenge Brewery, obviously brewed for St Patrick’s Day it was another coloured green beer from this brewery and to be honest they’d do better to concentrate on brewing better tasting stuff than the gimmicky stuff. My faithful ale girls, Gemma and Nicole at least joined me in trying the stuff whist the others had to make do with other beverages, which included James James keeping to his “no beer” promise and having a JD & Coke. Rob looks admiringly at Nicole's tackling of the green beer. Gemma is googling the treatment for ketoacidosis. The Spread Eagle is a cosy little place and once we’d terrorised the single little old lady off, we had a nice comfy corner all to ourselves. Also to the pub’s credit the Cask Marque certificate was hung on the wall directly inside the door meaning we got off to a good easy scan start. 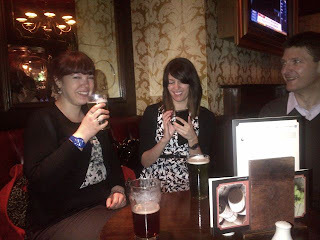 We didn’t linger in the pub but moved swiftly on once the green beer was drunk. 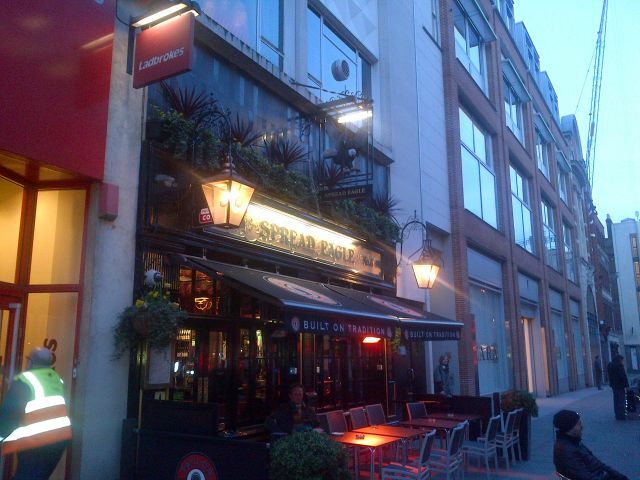 The next two places were another occurrence of pubs being located directly opposite each other. 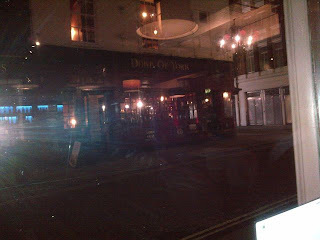 Firstly there was The Duke of York at number 8 Dering Street, which was the first of the two we entered after crossing New Bond Street. Another Taylor Walker place it was a similarly cramped but cosy place with much needed spaced dominated by a wrought iron spiral staircase. The beer range was worse than the Spread Eagle though, we could have pints of the green beer again or Fuller’s London Pride. Nicole and I kept the real ale fires burning as Gemma deserted us for horrible cider and the rest were committed to standard lagers although I have to give credit to Aussie Pete and Aussie Dad who were continuing in their own round of English Bitter. 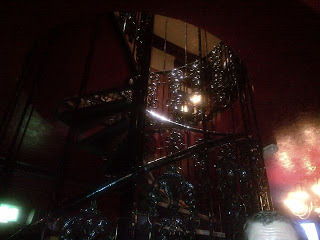 Spiral Staircase in the Duke of York. To give an idea of scale, James James's forehead is 11 foot high. The chap behind the bar didn’t have a clue about the certificate though, although his one-toothed Irish colleague who he asked, seemed to think he’d seen the certificate once before. But despite much hunting neither of them could lay their hands on it and we had to admit defeat on the scanning front. 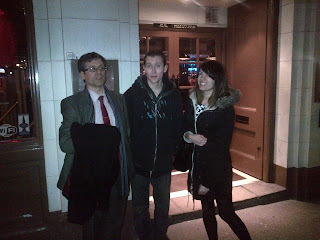 BGC, James James & Gemma outside Bonds. After my illness I am now skinnier than both of them. As previously mentioned the next pub on the list was but a short stroll over the road, to number 11 Dering Street, a rather smart wine-bar looking place called “Bonds” which is ran by the Stonegate Company. Alas though Ed wouldn’t be joining us as he decided that it was time for him to leave after many harassing text messages calling him to his other appointment. All I’ll say is that I bet you wish you’d stayed with us know hey Ed? The ale selection in Bonds was rather poor (I seem to recall only Greene King IPA available) but their full beer range was much more comprehensive resulting in Meantime London IPA for most of us. James James’s no beer promise finally cracked, as he joined Buddy Rob in a bottle of bud. Bonds certainly wouldn’t be my first choice of pub, being a dimly lit trendy sort of place, whereas I prefer to be able to see whom I’m drinking with and prefer a more scruffy bunch of fellow drinkers (not for a minute I’m suggesting the rest of the tour is trendy by the way). But the beer was fine and they had the certificate easily available so I shouldn’t be too harsh especially as I was treated to a nasty birthday Jägermeister shot from the ladies. So it was three pubs down, two to go but it was here than the group split. James James was obviously easing himself slowly into tour life as he decided to leave early and the ladies joined him after agreeing that perhaps a five pub crawl wasn’t entirely appropriate on a Tuesday night. Still the tour stalwarts carried on as we travelled slightly more south down New Bond Street and cut down the alley way of Avery Row to the Iron Duke, our second pub named after Arthur Wellesley. This is a small Fuller’s pub which compared to some of their very smart and gleaming premises is a rather muted place although the pairs of leather boots adoring the walls are quite fun. I had a pint of Fuller’s classic ESB whilst Micky treated the rest of the gang to crisps. The bar staff seemed rather indifferent to their clientele though and requests for the location of the certificate drew blank looks and therefore no scan. 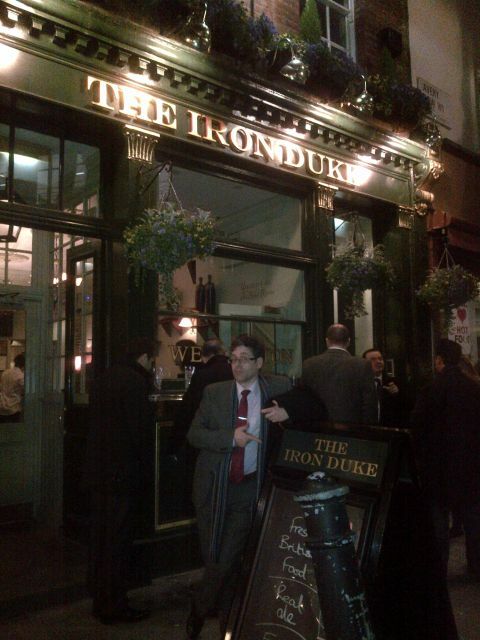 Iron Duke - BGC with cast iron constitution. The final stop was the Coach and Horses in Bruton Close but first we had to visit the historical piece of interest which I mentioned earlier. Right on the path than connects New and Old Bond Street is a statue of two elderly gentlemen on a park bench. 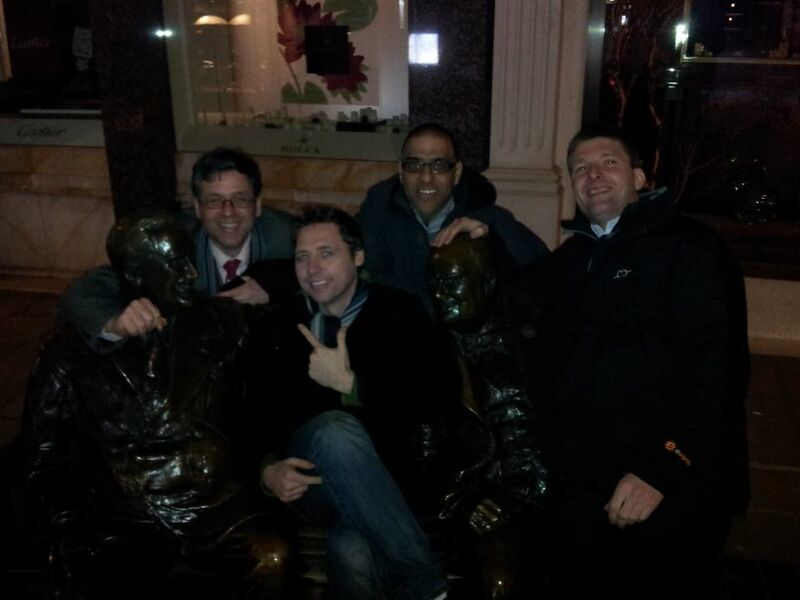 The gentlemen in question are actually Winston Churchill and Franklin D Roosevelt and the statue is called Allies and was a gift from the Bond Street Association to celebrate 50 years of peace. I bet both Winnie and Frankie and well pleased to have fought for freedom for this! 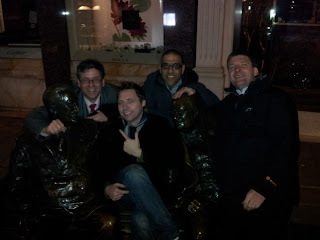 Doing our best to break the peace, we each took hilarious turns sitting with the two statesmen and probably generally took away all the dignity that the statue has. But anyway, if you’re even in this area do look out for it as it’s the sort of thing you miss completely and is well worth a photo. This apparently is the way to treat statesmen and politicians in Australia. Slightly retracing our steps to the Coach and Horses which was our third Taylor Walker pub of the evening. This is a rather incongruous black and white half-timbered wedge shaped building stuck in the middle of an otherwise very modern looking street. Not sure whether the pub is totally authentic but we got a warm welcome from the jolly barman even though the beers on offer included the bloody green beer again! 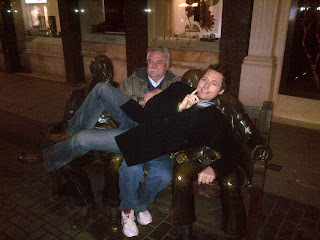 BGC and Coach and Horses - That cocked leg is catching! There was quite a funny dynamic going on between the two main barmen; one a younger oriental type was quite offhand and dismissive of us, especially when we asked for the certificate. He pretended to know what it was and then claimed he didn’t where it was when asked for its location, but when we asked the older chap he instantly pointed to it hanging on the wall. It was no surprise then who we asked to take a photo of us all having one final sticky Jagermeister for the road. The rest of the gang wandered back towards Oxford Street and a famous burger place beginning with M. I on the other hand made my way back to Paddington and a famous burger place beginning with B and the last train home. Cheers BGC! We'll bring grapes and Lucozade. And that should have been the end of the night and the tour saga but upon waking the next morning, I had an immediate appointment with the infamous big white telephone, which is unusual for me as if I have a problem with over indulgence, it’s usually an immediate process, i.e. vomming on the actual night, not the morning after. Putting it all down to the bad burger I made my way to work via the train toilets and then had several visits to the office loos as well. Things were showing to have gone too far when I ended up not being able to make it in time and (apologies for the rich language) spewed in a little store room which Ed likes to call his “Teddy Bear’s Lair” (honestly, this is true). Sent home in disgrace, the rest of the day didn’t improve matters and to cut an awfully long story of aches, pains, lots more vom, chronic dehydration and a visit from the emergency doctor short, Thursday morning saw me in The Royal Berkshire Hospital’s A&E department being treated for Diabetic Ketoacidosis by means of a million and seven different pipes being stuck into various parts of my anatomy, pumping me full of various fluids. Friday saw me on a general ward being entertained by my three fellow bed patients, a quite quite mad elderly man who talked constantly to himself and had to be shushed all night by the nurses. Upon being questioned by the doctor as to why he was here he said that he’d “fallen out of a plane and smacked his balls” to which the doctor declared, “you’re fine, lets get you home.” There was also a puffy faced alcoholic who’d taken some sort of tumble. He amazingly turned out to be the same age as me although even my cruellest of critics would say I looked ten years younger than him. Highlight of our interaction was watching him bring up his Friday lunch fish and chips into his lap, an event he then proceeded to tell anyone who’d ring his mobile (which was everyone, every 5 minutes). Finally there was another elderly chap who had short term memory loss, something he never seemed to forget as he told anyone who was either interested or not interested all day long. Ah, the NHS, got to love it haven’t you? Still, it made me forget what agony I was in and saw me home for the weekend although I’m not sure Mrs BGC has completely forgiven me for making us miss our Berlin trip which was meant to be my main birthday present. On my return to work Charlie quipped “longest hangover ever that!” all I can say in return is that it must have been the burger. Sympathy number 1? = Mrs GBC screaming that I “have to look after myself” whilst hitting me. So who exactly was in hospital? Sympathy number 2? = The “no vomming” sign now hanging on Teddy Bear’s Lair. Thanks guys. It's not "his" Teddy Bear's Lair, it is "the" Teddy Bear's Lair. Where I am the Teddy Bear (because Teddy is a shortening of my name and I'm damn cuddley. Seriously. Also, as ever you've misrepresented my drinking choices. I had the green pint in the first place too! Thanks for a great night. 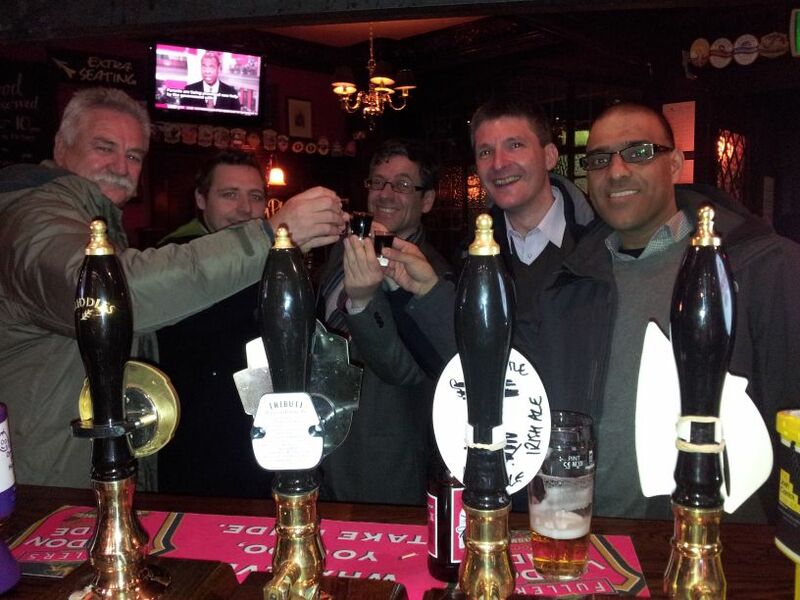 It was a pleasure to meet peter's work mates and share some ales with them. Now I know why Peter enjoys the lifestyle he has so much. 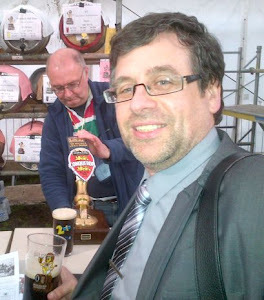 Hopefully if I get to come back over I can catch up with you all again and enjoy some more of England's finest ales. Sorry to hear that you were sick after a such a good night. Hey Michael, thanks for the message and great to have met you on the night - feeling much better now thanks, but will be taking it easy over the next couple of weeks. Ed, can you explain the smell of rotting flesh from the false floor in "the" lair?